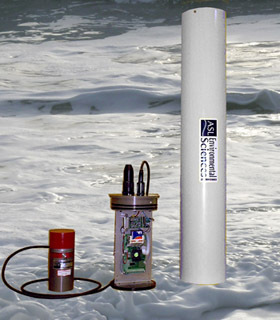 Data Logger Compatible with Imagenex 881A Sonar records images at regular intervals over extended periods of time. Photo above depicts an IRIS deployment using a bottom tripod frame. In this study, images were taken at discrete intervals to observe near-bottom ocean processes in a dynamic coastal environment. Such studies can be used to parameterize numerical modeling of sediment transport within moveable bed materials.